When I was a little girl, my mother listened to the opera on the radio every Saturday and really wanted me to enjoy it with her. While I inherited her love of books, history, and museums, I never liked opera, although I have friends who enjoy it. Perhaps I was rebellious. But I had never seen opera on a cruise ship until, that is, I sailed aboard the MSC Divina. It’s the only ship in the Caribbean offering an afternoon performance of opera, or more specifically, “Amami Quanto Io T’amo” sung in the second act. I can’t begin to explain how much I enjoyed the experience. 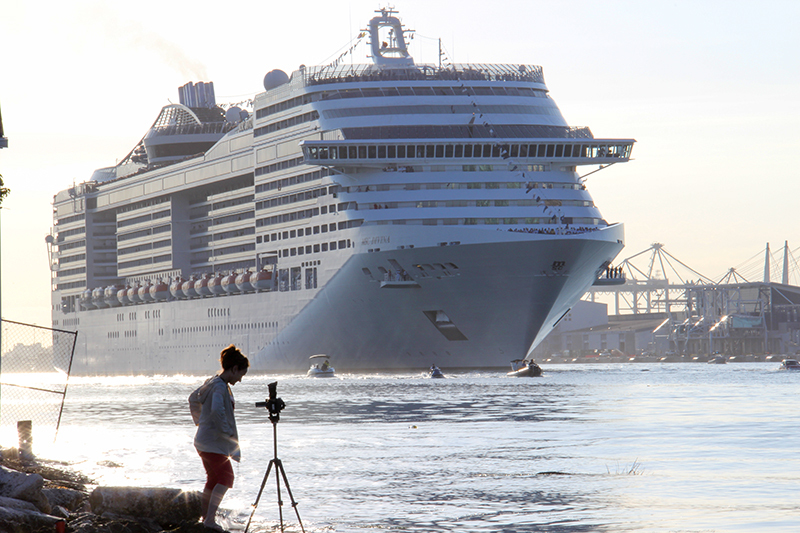 MSC is an international cruise line, with ships sailing all around the globe. Although based in Geneva, MSC has been a big player in Europe, Asia, and South America. But until this year an MSC ship only sailed from PortMiami during the season. Now, however, the line’s first in the Caribbean year-round, MSC Divina offers the abbreviated opera, Verdi’s La Traviata. Part of an excellent entertainment program, it’s an afternoon event on a sea day and a classic experience utilizing dancers and singers who perform two shows nightly – a different one each day – throughout the week’s cruise. Presented by Cruise Director Andrew Schlemmer, the talented international cast interpreted the opera and called it “Love Me,” (as much as I love you) or Amami Quanto’Io T’Amoi. It tells the tragic love story of Violetta Valery and Alfredo Germano, with each act interpreted by classic ballet performers. Although notably grand, it was only one afternoon of a lovely week aboard the huge, 140,000-ton ship with about 4,000 other guests. That number may jolt you, but the ship offers plenty of room because crowds are minimal. 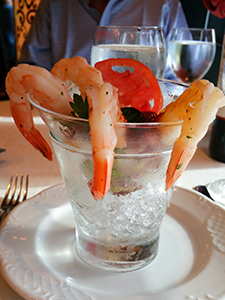 A lavish, multi-stationed Lido deck offers everything from Asian specialties to traditional British breakfasts. There are also great burgers, pizza and many classic Italian specialties. We enjoyed our dinners in the lovely Villa Rose restaurant (and yes, it is red), tastefully decorated with gold-tone metals and rich red upholstery, draperies and carpet. On the other hand, another restaurant, the Black Crab, is open for lunch on sea days. 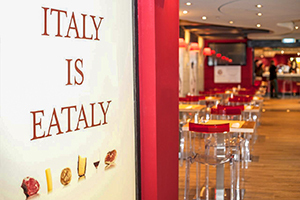 Famed Eataly, a branch of the Italian restaurant popular in New York, Chicago, São Paulo, Tokyo and elsewhere, is open for lunch and dinner. Of course, if you eat a lot, you will want to work it off and the Fitness Center, part of the Aurea Spa on Deck 14, will help. An outdoor stretch class is another tool, but I found just walking back and forth from my cabin on Deck 13 to the beautiful Pantheon Theater on Decks Six or Seven worked out to about a mile or two a day. 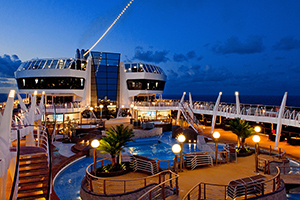 MSC Divina’s design is probably best defined as Modern European or Modern Italian. It makes lavish use of marble throughout. Colors are bright, but the Silver Lounge and Black and White Lounge are toned down – and also popular. Overall, my personal fave is the Golden Jazz Bar (where members of Boston’s Berklee College of Music perform) with a bright orange decor and, pardon the pun, jazzy furnishings. Our sailing was an Eastern Caribbean itinerary with stops at Phillipsburg, the capital of Dutch St. Martin (but with tours to the French side as well), San Juan, Puerto Rico and Nassau in the Bahamas. Alternate weeks, guests visit the Western Caribbean, with many European guests opting for two week, back-to-back cruises. 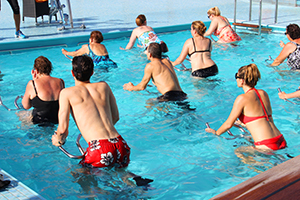 Three sea days offer a variety of activity from the ubiquitous trivia and bingo games to dance lessons, and Italian language lessons. Also, the Casino Veneziano is open pretty much all day long. And the Balinese massages in Aurea spa are fantastic. And did I mention the art auction? The Children’s Program set on Deck 18 accommodates kids from infants to teens in three different groups. The comfortable well-equipped areas are large and colorful. On our cruise, there were 66 infants, 550 children three to seven, and 516 12-17 in the programs. Shopping is almost an art form on MSC Divina’s Decks 6 and 7 and the overflow often takes to the pool deck on sea days. MSC also has big plans for the Caribbean. MSC will soon debut MSC Seaside, the line’s second Miami-based vessel, and designed to look like a beachfront condominium. Guests will enjoy a day at Ocean Cay MSC Reserve, the line’s newly announced private island. It boats 11,000 feet of white sand beach, and a 2,000 seat amphitheater with water sports and beach games. MSC Divina’s multinational officers and crew are terrific with Americans (on my sailing some 80% of the manifest were North Americans). They know we like ice in our drinks, wash clothes in our bathrooms and love menus that contain foods we recognize. I spent a lovely week aboard, a great week with great entertainment. My mom, I hope, knows I loved my day at the opera.